September 21, 2017, 3pm. About Me, continued. I just remembered, when I went to Wayfair website, that, Wayfair is not a supermarket. Wayfair is a furniture store. Fairway is the name of the supermarket but I am almost certain the woman in the bathroom asked me where is Wayfair supermarket. “A Poor Wayfaring Man of Grief” (originally titled “The Stranger and His Friend”) is a seven-stanza poem written in 1826 by James Montgomery. The words of the poem have since been adopted as a Christian hymn. “A Poor Wayfaring Man of Grief” was a favorite hymn of Joseph Smith, founder of the Latter Day Saint movement. The hymn was introduced in the church by apostle John Taylor, who learned the hymn in 1840 as a missionary in England. Taylor included the hymn in the Latter Day Saints’ Manchester Hymnal, which was used in England from 1840 to 1912. The hymn was also included in the church’s 1841 hymnal published in Nauvoo, Illinois. Unlike the version in the Manchester Hymnal, the hymn in the Nauvoo hymnal included music composed by Taylor. The hymn was originally written as a Christmas hymn.On the afternoon that Joseph Smith and his brother, Hyrum, were killed by a mob in prison in Carthage, Illinois, the Smiths requested Taylor sing the hymn twice. Groceries USA [Hudson River] https://www.bing.com/search?q=groceries&form=EDGTCT&qs=PF&cvid=1cdadc7255bd4ada89cde7260c275d21&cc=US&setlang=en-US&PC=TBTS Mark Groce: I’m Mark Groce, and you’re listening to TransitTrax, New York City Transit’s podcast service. Riding the system – whether on a subway train or a bus, you’ve undoubtedly heard this message. Audio from R142 car: Ladies and Gentlemen, this is an important message from the New York City Police Department. Keep your belongings in sight at all times. Protect yourself. If you see a suspicious package or activity on the platform or train, do not keep it to yourself. Tell a Police Officer or an MTA employee. Remain alert and have a safe day. After I left NYU School of Dentistry, on my way back to the subway, when I saw these packages of ice in a cart in front of Morton Williams supermarket, I asked the employee if I could take a picture, explaining to him that I’m trying to become a photographer. He is now a plaintiff in a legal case against Berkshire Hathaway, Verizon and other corporations including the Mormon Church of Satan. I should have looked closely to see if the ice is Thomas Ice brand ice cubes. There is no website for THOMAS ICE, Brooklyn. Thomas Ice is the executive director of the Pre-Trib Research Center on the campus of Liberty University in Lynchburg, Virginia. The research center was founded in 1994 by Tim LaHaye and Ice to research, teach, proclaim, and defend pre-tribulationism. The center currently sponsors prophecy meetings and conferences and provides speakers for the purpose of discussion and lecture on the topic of pre-tribulationism. Thomas Ice engages in frequent debates on the subject of the Rapture. He has also written and co-written over 20 books and articles on the subject. He is a frequent conference speaker at Bible conferences around the world. Ice serves as an Associate Professor of Religion at Liberty University. “Thomas Monson” redirects here. For the English politician, see Sir Thomas Monson, 1st Baronet. 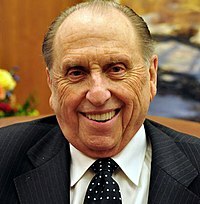 Thomas Spencer Monson (born August 21, 1927) is an American religious leader, author, and the sixteenth and current President of The Church of Jesus Christ of Latter-day Saints (LDS Church). As president, he is considered by adherents of the religion to be a “prophet, seer, and revelator.” A printer by trade, he has spent most of his life engaged in various church leadership positions and public service. Sir Thomas Monson aged 47, 1610, by an unknown English artist. Sir Thomas Monson, 1st Baronet (1565 – 29 May 1641) was an English politician and supporter of King James I. Sir Thomas was the son of Sir John Monson of South Carlton, Lincolnshire, a past High Sheriff of Lincolnshire. Sir Thomas’s younger brother was Admiral Sir William Monson. Thomas was educated at Magdalen College, Oxford, matriculating at the age of fifteen in December 1579, and at Gray’s Inn, where he was admitted a student in 1583.